“Riddick,” which will be released on Blu-ray and DVD combo pack on Jan. 18, 2014 from Universal Home Entertainment and is rated “R,” also stars Karl Urban, Dave Bautista, Katee Sackhoff, Jordi Mollà, Matt Nable, Bokeem Woodbine, Raoul Trujillo, Conrad Pla, Noah Danby and Neil Napier from writer and director David Twohy based on characters created by Jim Wheat. Note: You must be 17+ to win and receive this “R”-rated film. To win your free “Riddick” combo pack courtesy of HollywoodChicago.com, get interactive with our unique Hookup technology directly below. That’s it! The more social actions you complete below, the higher yours odds of winning! Completing these social actions only increases your odds of winning; this doesn’t intensify your competition or lower your odds! Vin Diesel reprises his breakthrough role in “Riddick”: the much-anticipated new chapter in the epic adventures of the most wanted man in the universe. The all-new thriller finds the title character trapped on a sun-scorched planet and pursued by ruthless bounty hunters eager to collect the reward for Riddick’s capture – dead or alive. Savage alien creatures, expansive desert landscapes, monster storms, jet hogs and an arsenal of futuristic weaponry make this the most exhilarating episode to date in writer and director David Twohy’s breathtaking series of futuristic blockbusters. 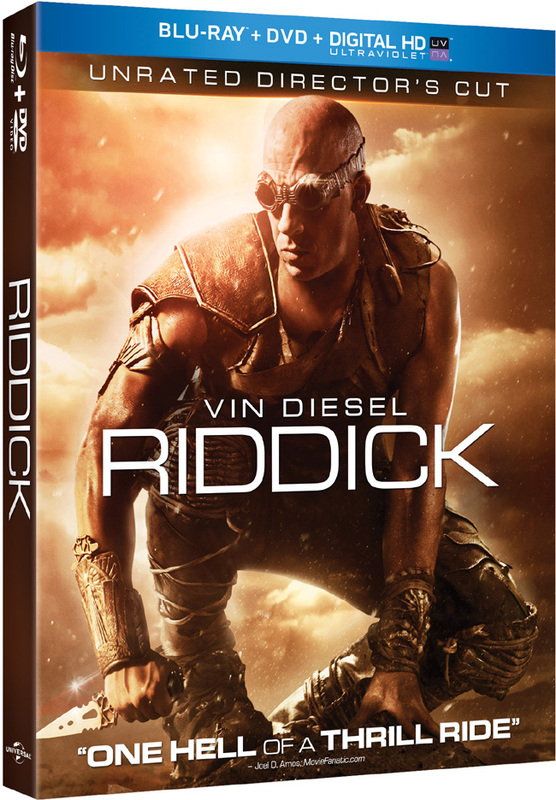 “Riddick” with Vin Diesel comes to Blu-ray and DVD combo pack on Jan. 18, 2014. This HollywoodChicago.com Hookup is simple! Just get interactive in our unique Hookup technology above. We will award 10 free Blu-ray and DVD combo packs based on social entry numbers and/or randomly for our “Riddick” Hookup. Good luck!